The Variable Chooser can be used to select and inspect any dynamic variable of the loaded model. The names, kinds, types, values, quantities, units and descriptions of the variables of the loaded model are listed in right part of the window. 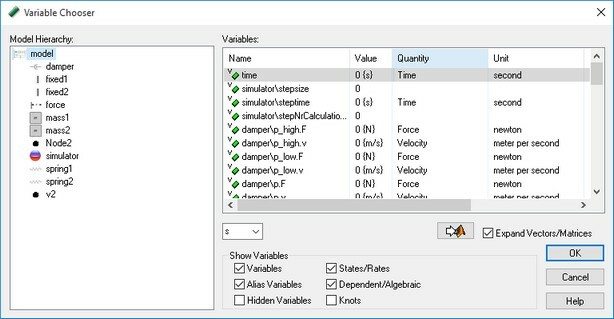 The list of dynamic variables displayed, depends on the selected (sub)model in the left part of this window. The left part displays the complete model hierarchy. The Variable Chooser shows all variables of a model. • Model: At each level of the hierarchy, submodels can be selected and inspected. The right part of the window then shows the variables that are part of that submodel. To see all variables including time, select the top level of the hierarchy, i.e. the main model listed on top. Click on one of the variable items (Name, Value, Quantity, Unit, Description, Kind, Arithmetic Type, Value) to order the variables alphabetically. • Input Probes/Output Probes: In the Frequency Response dialog pairs of input variables and output variables can be selected for linearization. If input variables have been selected they are shown under the input probes key. If output variables have been selected they are shown under the output probes key. • Favorites: variables that are used a lot can be added to the favorites key for easy use. • Variables: Select the desired variable from the list (use your mouse pointer), select the desired Unit from the drop down list and click OK to close the window. • Minimum and Maximum values: If you run a simulation in Debug Mode , the minimum and maximum value of every variable is shown. • Unit Selection: If a quantity was assigned to the selected variable with multiple units (e.g. position -> m , mm , inch , etc.) you can switch units by the unit selection at the bottom of the variable list. • Expand Vectors/Matrices: Select complete vectors and matrices or only their elements. • To Matlab: Use the button to export a variable value to Matlab. You will be asked to enter a Matlab variable. Data will be exchanged between this Matlab variable and the variable that is selected in 20-sim. • Show Variables: Select the specific kind of variables (Variables, States/Rates, Alias Variables, Dependent/Algebraic, Hidden Variables, Knots) that should be displayed in the Variables list. • Add to Favorites: add the selected variable to the favorites list. • Add to Input Probes: Add the variable to the list of inputs for linearization. This list is used in the Frequency Response dialog. • Add to Output Probes: Add the variable to the list of outputs for linearization. This list is used in the Frequency Response dialog. • Copy: copy the variable value to clipboard. • Copy with Unit: copy the variable value and corresponding value to clipboard. • Copy Specified: Specify the items that should be copied and then copy to clipboard. 1. All equations in 20-sim are calculated using standard SI-units. You can however display the results, using whatever Unit you like. In the Variable Chooser, you can change the unit using the little drop down list just above the Show Variables section. 2. To see global variables, select the top level of the hierarchy, i.e. the main model listed on top. 3. To quickly find some variables out of the list, add the keyword interesting in the equation description. In the Variables list, de-select States, Rates, Algebraic Loops, Dependent States and Dependent Rates. Then only the interesting variables are shown. 4. When using large models, opening the Variable Chooser may take some time. Use the General Properties window to set the maximum number of variables that should be shown. 5. To hide variables from the list, add the keyword hidden in the equation description. Hidden variables are not visible in the Variable Chooser. 6. When you open the Variables Chooser from a plot, it will also show the parameters of a model or submodel, to allow parameters to be plotted.